Cuff bracelets are statement pieces. Joyo makes a deeper statement with beautiful design, technology, and environmental kindness. Jenn Liddiard, founder and artisian, shares, “I work at the intersection of art and technology making laser cut wood jewelry. Being environmentally friendly is also an integral part of Joyo.” Prior to starting Joyo in the summer of 2012, Jenn made gemstone jewelry for many years, and while obtaining a certificate in graphic design from the School of the Museum of Fine Arts in Boston, she developed her love of patterns and clean, modern design. She's always thought lasers are cool. Designing and making laser cut jewelry is a perfect intersection of all these passions. Jenn does the laser cutting herself, and does all of the design, sanding, oil finishing, and assembly by hand. Quality materials and being kind to the environment are an integral part of Joyo. 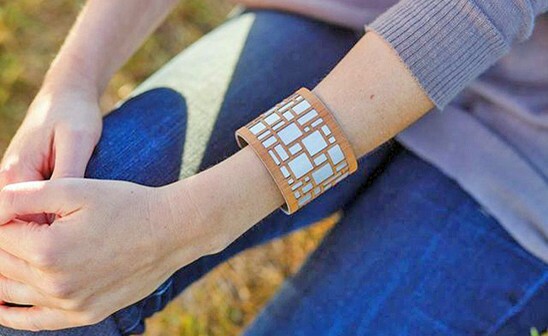 Laser cut cuff bracelet in cherry wood is a prime example of her art. Patterns are cut into real wood and layered over a hand brushed or dramatic black anodized aluminum metal cuff. “I love taking a natural material like wood and transforming it into a unique, intricate, unexpected form. I get inspiration from museums, architecture, sidewalk patterns, history, far off places, and the natural world,” Jenn said. A 100% recycled ultra-suede lining makes this bracelet incredibly comfortable to wear. All Joyo laser cut jewelry is designed and handmade by Jenn Liddiard in Scituate, MA. Cuff bracelets are statement pieces. Joyo makes a deeper statement with beautiful design, technology, and environmental kindness. Prior to starting Joyo in the summer of 2012, Jenn made gemstone jewelry for many years, and while obtaining a certificate in graphic design from the School of the Museum of Fine Arts in Boston, she developed her love of patterns and clean, modern design. She's always thought lasers are cool. 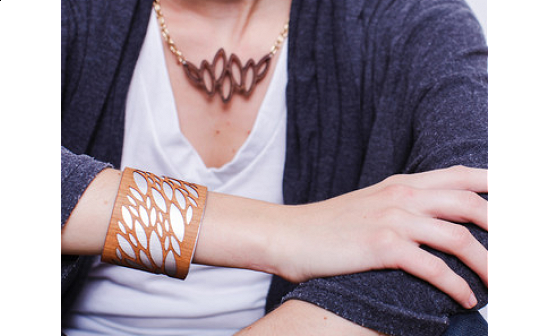 Designing and making laser cut jewelry is a perfect intersection of all these passions. Jenn does the laser cutting herself, and does all of the design, sanding, oil finishing, and assembly by hand. Quality materials and being kind to the environment are an integral part of Joyo. Laser cut cuff bracelet in cherry wood is a prime example of her art. Patterns are cut into real wood and layered over a hand brushed or dramatic black anodized aluminum metal cuff. “I love taking a natural material like wood and transforming it into a unique, intricate, unexpected form. I get inspiration from museums, architecture, sidewalk patterns, history, far off places, and the natural world,” Jenn said. A 100% recycled ultra-suede lining makes this bracelet incredibly comfortable to wear.